ISTANBUL – Turkey should readjust its legal framework regarding the use of tear gas grenades to prevent further risk of death and injury, according to a European Court of Human Rights decision. The decision came yesterday as a result of the chamber’s session on the case of Abdullah Yaşa, who had applied to the European court over his injuries caused by a tear gas grenade during a police intervention in 2006. The court ruled in favor of Yaşa, finding Turkey in violation of the article related to the prohibition of torture and inhuman or degrading treatment. The court also fined Turkey 15,000 euros to cover all damages, and another 5,000 for costs and expenses, however, the chamber judgment may not be the final decision. In case either of the parties requests the case to be sent to the Grand Chamber of the Court, the case may be reevaluated, marking the end result as the final ruling. The incident, which occurred in 2006 when police forces intervened in demonstrations described as “unlawful” by the ECHR, prompted the court to also judge Turkey in light of Article 46, “binding force and execution of judgments,” according to the decision. The Turkish state needed to reexamine its present guidelines on the use of tear gas and “the safeguards surrounding the proper use of tear gas grenades needed to be strengthened in order to minimize the risk of death and injury resulting from their use,” the court stated. 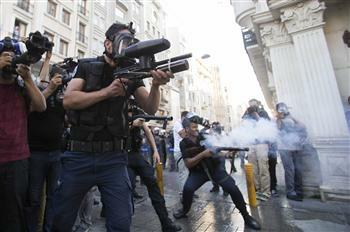 Turkish forces’ use of tear gas became a subject of debate after its excessive use during the Gezi Park protests, causing severe injuries to several protesters. Mustafa Ali Tombul, 17 years old, has been in a coma since he was struck on the head by a tear gas capsule during a police intervention in Taksim’s Tarlabaşı. In a similar case, Lobna Allani, a Turkish citizen of Palestinian origin, was also hit in the head by a gas capsule which forced her to undergo two brain surgeries, and left her in a partially paralyzed state. This entry was posted in News and tagged anti-government protests, democracy, demonstrators, Gezi Park, tear gas, Turkey on 16 July 2013 .